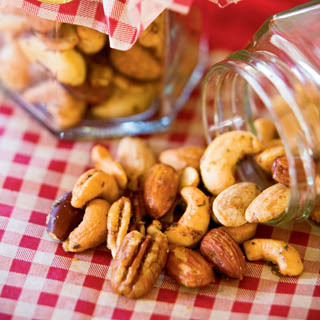 Savory nuts mixed with maple syrup, rosemary and cayenne make a great snack. In a bowl, toss the nuts with the maple syrup, olive oil, rosemary and cayenne. Spread the mixture on a rimmed baking sheet. The nuts can be stored in an airtight container for up to two weeks. Linked up at Vegetarian Mamma’s Gluten-Free Fridays.